Collecting the second half of Brian Wood’s Aliens: Defiance, this trade gathers issues - or episodes, as they’re referred to on each chapter’s title page - seven through 12. The end of volume one defined the shape of the story to come, and Wood solidly exploits this promise over the course of this book’s arc to wrap up his maxi-series. The derelict freighter Europa, salvaged by now-AWOL Colonial Marine Zula Hendricks and the rogue android Davis, is literally falling apart. To make matters worse, the ship has become home to a rapidly growing xenomorph. Forced to contend with these two issues, each of which can end only in certain death if not quickly resolved, Hendricks is stuck between a rock and a hard place, with only one option left. Suffering chronic pain from a back injury that nearly crippled her and addicted to a diminishing supply of painkillers, Zula wants to return to Earth. Weyland-Yutani wants their alien specimen. As Robert Frost once said, the only way out is through. After steadily building a deepening friendship between Zula and Davis, Wood puts them at odds for much of volume two, straining their relationship with difficult life or death choices. While Davis doesn’t necessarily agree with Zula’s command decisions, he does respect her choices and follows her orders. We’ve seen enough of Davis operating autonomously and disregarding orders he doesn’t agree with, so his willingness to help Zula in her mission to return to Earth and abandon their plans to disrupt Weyland-Yutani’s research into the xenomorph speaks volumes to how far these two have come to grow on and rely upon each other. As with the previous six episodes, Wood is more concerned with the human (and even artificial human) condition, letting his characters drive the story and take center stage. We don’t get a lot of alien action, but what is present is awfully powerful and graphically depicted. The xenomorphs are the ultimate killing machine, and this is never forgotten by the characters or creators. Those hoping for a relentless assault of alien carnage and non-stop action will be sorely disappointed, though. The violence comes in quick bursts, but Wood keeps his characters front and center at all times. 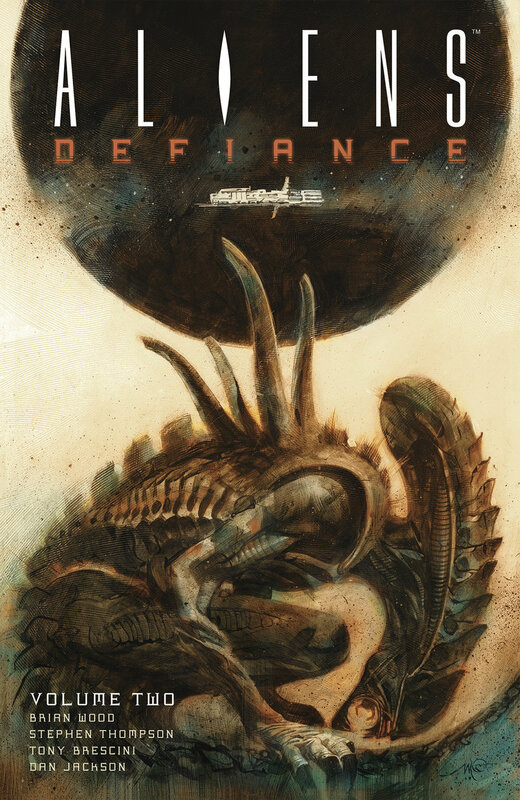 Defiance is a more literary approach to Alien lore than an action-packed creature feature. Thankfully the universe is broad enough for such an endeavor and I appreciate Wood’s thoughtful approach to this particular property. As with his larger body of works, much of Defiance’s themes contend with grappling between idealism and reality. Like DMZ and The Massive, Zula and Davis are moral crusaders, hoping to change the world for the better. Their ambitions are certainly well-intentioned, but when confronted with the wider world, or in this case universe, there’s a certain unstoppable force paradox at play and they will, inevitably, collide. For the most part, I dug the hell out of what Wood set out to do with Defiance. However, there were a few hiccups that prevented from me enjoying the experience more fully. Much of this comes down to a filler issue early in the book — and I use the term “filler” loosely here as I recognize it ultimately helps to further’s Zula’s characterization, her relationship to Davis, and her PTSD. I’m just not a fan of how this particular chapter was constructed, and I’ve placed my thoughts on why in the spoiler section. Much of the plot of episode eight revolves around a dream-like scenario, which isn’t immediately apparent. When I first began reading this chapter I was confounded by what I thought was a glaring mistake on behalf of the artist and editor, who seemingly both forgot that even though he’s a synthetic Davis still requires a suit to survive the vacuum of space. We're also treated to xenomorphs flying through space like Superman, a particularly ridiculous conceit that instantly threw me overboard and made me wonder what the hell Wood was on when he scripted this. While it does illustrate Zula's subconcious state of affairs well, making the aliens both a physical and existential crisis for her, particularly as her mobility continues to degrade, the execution of all this didn't sit well with me. I'm not a big fan of "It was all just a dream!" stories to begin with, so much of this issue frustrated me. The other issue that kept me from enjoying this volume of Aliens: Defiance came down to the artwork. Volume Two has a rotating roster of artists with Stephen Thompson dipping in for issues seven and 10, delivering a strong sense of style as the book opens. Unfortunately, Tony Brescini isn’t able to deliver on the elegance Thompson showed in the book’s first chapter, and his artwork for episodes eight and nine leave a lot to be desired. I recall liking his style, for the most part, when he filled-in for episode four of volume one, but here his work looks sloppy and harsh. His depiction of Zula, especially, is ill-defined and inconsistent, and sometimes just flat-out rushed and ugly. In some instances, the bones of Zula’s face take on strong corners and angles that give her sharp edges along her cheeks and jaws, as if she’s starved. In other panels she looks doughy and soft. And in other places still, she looks like a lump of rock. Under Brescini’s hand, Zula never actually looks like Zula. You know it’s her, because who else could it be given the setting, but his renderings of her is a far cry from Tristan Jones’s work in the prior volume or Thompson’s in this volume. Brescini’s work certainly stands out, but never for good reasons. Thankfully, lumping his work into the middle of the story means we at least get a strong open and close to this volume. Eduardo Francisco delivers a clean, well-drawn finale to Defiance, tackling art duties for episodes 11 and 12. The artwork on these two issues are the best of the bunch, and he stages the action scenes well, along with providing plenty of details to illustrate the worsening state of the freighter Europa. While the art is a mixed bag, I’ve grown to appreciate the story Woods set out to tell and appreciate the thematic resonance this work carries. If you’ve read his creator-owned works, then you’ll know what I mean when I say this is very much a Brian Wood book, only set within the Alien universe. At first I was slightly disappointed in the finale, but as I’ve sat with it a bit longer I’ve come to enjoy it a bit more. Over the course of Defiance, Wood has very gradually narrowed the scope of this particular story to reach its logical conclusion. It’s not an exciting, action-oriented romp, and much of Defiance has been about Wood subverting expectations, shying away from grandiose violence in favor of smaller, more intimate scenes. He maintains this particular style moving into the book’s finale, and while there’s certainly action and plenty of other things happening, it’s also not the type of ending one expects of an Alien story. It’s quieter and softer, aiming for more emotional resonance than adrenalized satisfaction. Zula isn’t the type of woman to run around with a flamethrower, and likely isn’t even physically capable of that, but that doesn’t stop things from exploding wildly out of control whether she wants it to or not.